A Great Chiropractic Website + Target Traffic + Automatic Follow-ups = More Patients Into Your Chiropractic Practice. Convert Them Into Leads — Always available contact form, phone number, special reports, and follow-up emails to entice and remind your customers to contact you for an appointment. So What’s The Other Big Difference Between An Ordinary Website And A Great Chiropractic Website? … Time’s Up. That’s The Most Amount Of Time You Are Going To Get From A Web Surfer Before He Clicks Away From An Ordinary Website. 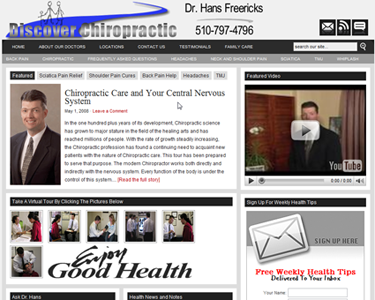 If You Are Going To Get A Website, Get A Great Chiropractic Web Design. You Want To Capture And Convert Web Surfers Into Patient Leads. Okay, You Are Convinced That Your Practice Needs A Great Chiropractic Website. What Else Do You Need To Pull In More Patients Online? HOW WILL ANYONE FIND YOUR GREAT WEBSITE? 3. You Can Develop Top Search Engine Rankings. OF ACQUIRING PATIENTS ONLINE . . .
Let’s face it… It feels like a chore to get your business on the internet…that’s why you need to have a Game Plan and the right team to implement your success. With us, you will receive your own Great Chiropractic Website, A Traffic Game Plan, a strategic checklist…everything that you need to start attracting prospective patients to your site where they can take action and contact your office. We want to make it easy for you…and with your Game Plan in hand, you’re ready for business online! Limited Phase 1 Release Discount * Only Available Until There Are No More Spots On The First Page Of The Search Engine Results. As An Added Benefit, We Can Host Your Site, Automate Your Patient Follow-up, And Keep Up Your SEO For Only $97 A Month.